This is just part of the Butler's Pantry. A transitional hallway between the kitchen, Dining Room and the rest of the Buttler's Pantry. Love the flooring. Does anyone know the source for this flooring? The floor looks beautiful here, but I searched the site given and there's nothing like that on that site that I saw. This is a natural stone. Stone availability is dependant upon many things such as trade or shipping issues, quarry shutdowns, manufacturing alterations or pattern changes, etc. Also, what is on websites of suppliers is not always their entire stock. Please check with your local stone suppliers for options that would be similar. cabinet paint color again! Name of paint and glaze - Letitia, thank you for being so generous with you time answering lots of questions.Do you have a specific brand and name for the glaze used on the cabinets. This is a gorgeous space.Congratulations. I love the color theme. Can you tell me the color on the walls and what back-splash was used here? Thanks for your help. I'm trying to remodel an old 70's house that still has the green shag carpet! =) I wish I lived close, I'm in Oklahoma. You guys did a marvelous job on this. I absolutely love this room! If you have any questions, you can always e-mail me and if I have time, I will help as much as possible. Pics of the space are always helpful. What color are trim and cabinets? Thanks! The trim looks a greenish color. Is that a Ralph Lauren color? Could you please tell me who's cabinets these are? Thank you Letitia. I appreciate your detailed reply. 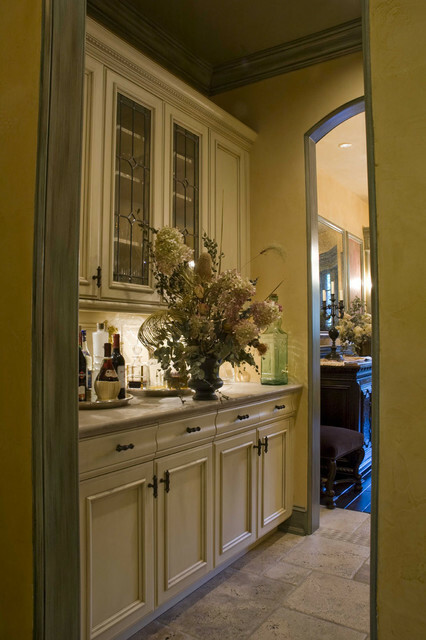 Love the cabinets..I'm all for Tuscan design. You did a beautiful job! What paint color is used on the cabinets? Ralph Lauren's Nantucket White is a similar creamy white. That would work, but this one is glazed as well. The lead glass was custom made by glass artist. Love the hardware! - Where could I order or buy the hardware and what is the name of it? What hardware knobs and pulls were used? I am not sure, but will try to find out for you. Dimensions - What are the dimensions of the hallway? Also, how long is the countertop and what is the total heigth of the cabinet section? Beautiful! As I recall this hallway is 5.5' wide and the length of the caibinet is 6'4". There is a true Butler's Pantry to the right that is not in view, through another door once in the hallway. What countertop was used? Your Tuscan portfolio is beautiful. That was actually a travertine top that we sealed... A lot of people are afraid to use these kind of surfaces, but we used it in this space and on the island bar top. Both have held up very well!!! Would you have photos of a kitchen that continues to this beautiful pantry?? Want this! Perfect. YES, I DO... you can find them at www.myersdesign.net under the Tuscan Residential Projects. This was such a wonderful project.... sure wish you could see it in person! It was a real privilege to work with such creatively minded clients. What kind of countertop is this? I am sorry I am just replying! This is limestone with a reverse Ogee Edge. When combined with a wet or dry bar, butler's pantries can be found between the kitchen and dining room. This is great way to transition from a casual space to a more formal space.